We’ve found a lot of planets far away from the Sun but know comparatively little about what may be circling nearby stars. The rationale is clear: The Kepler mission’s field of view was carefully chosen to provide a large sample (over 145,000 main sequence stars) that could be studied for transits by the spacecraft’s photometer. Looking out along the Cygnus arm of the Milky Way, far enough from the ecliptic plane to avoid the Sun, the Kepler stars have been providing statistical data to help us understand how common planets actually are in the galaxy. But as we saw with the announcement of a candidate planet around Alpha Centauri B, the news of planets closer to home excites interest. These are places close enough to us that they could conceivably be the targets of future interstellar probes. As we continue to look at the Kepler inflow, we’re also anticipating missions like TESS (Transiting Exoplanet Survey Satellite), scheduled for a 2017 launch, and PLATO (PLAnetary Transits and Oscillations of stars), scheduled for 2024, both given the charter of finding habitable planets around nearby stars. Image: Artist’s impression of a view from the HD 7924 planetary system looking back toward our Sun, which would be easily visible to the naked eye. Since HD 7924 is in our northern sky, an observer looking back at the sun would see objects like the Southern Cross and the Magellanic Clouds close to our sun in their sky. Credit: Karen Teramura & BJ Fulton, UH IfA. The robotic contribution to this work is a story in itself. We’re looking at a new degree of automation in the exoplanet hunt with Earth-based observatories, one that co-author Andrew Howard (University of Hawaii) likens to “owning a driverless car that goes planet shopping.” The Automated Planet Finder instrument at the Lick Observatory operates robotically every clear night of the year, the installation consisting of a 2.4-meter automated telescope and the high-resolution Levy spectrometer, searching a preprogrammed list of nearby stars using radial velocity methods in the hunt for low-mass rocky worlds. The Automatic Photometric Telescope (APT) at Fairborn Observatory in Arizona also factored in. Now in operation for fourteen years, APT is one of a cluster of automated instruments at the observatory. Its observations of the brightness of HD 7924 complemented the APF and Keck data to confirm the new planets, both of which are seven to eight times the mass of Earth and, in a configuration we’re now finding common, orbiting close to their host star, with periods of 15.3 and 24.5 days. They join the previously discovered super-Earth with a period of a scant 5 days. The large population of super-Earths orbiting close to their host stars was a surprise. Population synthesis models of planet formation had predicted that such systems would be rare. Planet cores were expected to mostly form beyond the ice line and rarely migrate to close orbits unless they first grew to become gas giants. Nevertheless, close-in, low-mass planets are common and often appear in compact multi-planet systems. Theoretical models are catching up, with refinements to the disk migration and multiplanet dynamics in the population synthesis family of models. A new class of “in situ” formation models have also been proposed in which systems of super-Earths and Neptunes emerge naturally from massive disks. 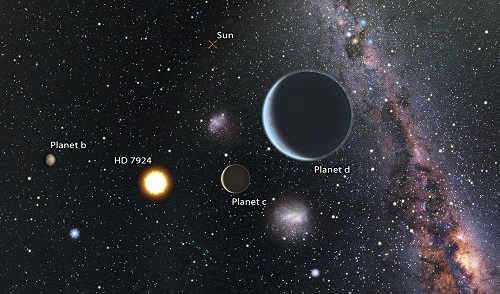 The first HD 7924 planet discovered (2009) grew out of the Eta-Earth Survey at Keck, in which Howard and colleagues searched for planets from a field of 166 nearby G and K dwarf stars. The team is now observing a subset of the Eta-Earth Survey stars with the Automated Planet Finder, with the two new HD 7924 worlds emerging from this work. With incident irradiation values 114, 28 and 15 times that of the Earth for the three planets, they’re not habitable by our standards of liquid water on the surface. But transits cannot be ruled out here and the paper adds that HD 7924 will be an excellent candidate for the James Webb Space Telescope. The upcoming launch of TESS offers the chance to observe the star closely for transit signatures. The paper speaks of building a census of small planets in the local stellar neighborhood (within 100 light years) as the Automated Planet Finder continues its operations. There are doubtless many planets to find, considering Kepler’s discovery of so many compact, multi-planet systems. The paper is Fulton et al., “Three super-Earths orbiting HD 7924,” accepted for publication in the Astrophysical Journal (preprint). But see also Howard and team’s 2010 paper on the Eta-Earth findings. It’s “The Occurrence and Mass Distribution of Close-in Super-Earths, Neptunes, and Jupiters,” Science Vol. 330, No. 6004 (2010), pp. 653-655 (abstract). This University of California Observatories news release is also helpful. Nice post! Just as a point of information, the ground-based transit surveys (HAT, SWASP, KELT) have been fully automated for several years. Indeed, the process of working the kinks out of the robotic observing software was one of the main reasons why the ground-based surveys really started finding things in ~2008, a couple of years after they began science observations. Yes, I’ve covered some of that earlier work, although I hadn’t realized the extent of it. I’m continually fascinated by how the robotic effort is progressing. This HD 7924 news seems like a step forward in public awareness as well. Can anyone familiar with these various techniques care to extrapolate what this will mean in terms of exoplanet discovery over the next 10 years of so? What fraction of stars will be characterized out to say 100 ly? What might that mean in terms of locating a habitable world, even detecting a life bearing one in that sphere? In 1000 years we could conceivably have probe data being sent back to Earth for all these worlds. I hope you’ll bear with me here, with my penchant for speculating on how planetary systems form. I was going to post a question on the nature of the Tau Ceti system when it came up a few days ago, but after reading a couple of papers first, I decided I’d found an explanation for its structure. The connection here is that Tau Ceti has a set of close in sub-neptunes/super Earths like HD 7924. The Tau Ceti system looks like how our system would be if Jupiter and Saturn weren’t so massive. Tau Ceti has five super Earths at 0.1, 0.2, 0.37, 0.55 and 1.35 au, and a disk starting at 10 au. If the planets are assumed to be on the same plane as the disk, then they are tipped at 35 degrees to line of sight, which ups their masses to sub Neptunian. The disk has no apparent gaps, so this would put the outermost planet at about 9 au just inside the disks inner edge. Tau Ceti as doesn’t have a Jupiter mass planet inside 9 au as this would have shown up by RV by now, but there is room between the planet at 1.35 au and the one at 9 au for a couple of Neptunian planets. Given the estimated mass of cometary material in Tau Ceti’s disk, the outer part of the Tau Ceti system looks like the result of the Nice model, but run without the Jupiter-Saturn resonance sending Neptune out past Uranus and scattering the Kuiper belt. The jist of this paper is that in systems with a high rate of gas infall a gap opens in the inner disk. Protoplanets that form in this disk spiral inwards through Type I migration. The innermost planet becomes becomes pinned at the disk’s inner edge and orbital resonances pin the others in place. In Jupiter’s case, Jupiter opened up a gap in the solar nebula disk, abruptly cutting off the infalling gas supply for its disk and freezing the arrangement of its protomoons. Saturn formed later than Jupiter. The solar nebula was a much thinner at that point and Saturn never had much of a inner disk gap. As a result, the inner moons that formed fell into Saturn, leaving only a few minor bodies behind with the exception of Titan, which formed at a late stage after the disk gas had dispersed. Tau Ceti’s inner planetary arrangement looks like Jupiter’s moons with several similar sized bodies in tight orbits arrayed in regular spacing. From what we know about the density of Sub Neptunes, they appear to have accreted some of the primordial nebula, so they must have formed quickly before the nebula dispersed. The terrestrial planets in our solar system are though to have formed after the nebula dispersed as they show no trace of a primordial atmosphere. When Jupiter opened a gap in the solar nebula, it would have starved the inner nebula of gas. The inner disk gap may have closed allowing the the sun’s inner planets to spiral into it. The terrestrial planets were formed from the left-overs. A test for this hypothesis is the stars with similar sized Earth to sub Neptune sized bodies with regular spacing in close orbits will not have a Jupiter (nebula gap opening) sized planet around them. This hypothesis also bodes well for M stars having Earth sized planets in close orbits, close enough in to be their habitable zone. Also see the ercent post about Tau Ceti (https://www.centauri-dreams.org/?p=33051). The so-called ‘compact planetary systems’, consisting of a series of (close orbit) medium-sized (mini-Neptune to Neptune) planets around solar type stars probably originate in the *absence* of a true gas giant (about Jupiter). Which in turn implies low to medium metallicity. At higher metallicity (threshold value? About 80% of solar? ), and hence more massive protoplanetary dust disk (proplyd), a gas giant is formed which absorbs most planetary material, leaving a little (just about the right amount for terrestrial planets?) in the inner region. Our situation. The really interesting question is, whether these very common compact systems can also possess (one or more) small terrestrial planets, preferably in the HZ. I expect this would be the case either on the very inside and/or on the outskirts of the system where the proplyd would have been less/least massive. Even if this is indeed the case it still remains very uncertain whether this would be inside the HZ. – At very high metallicities there will be only one very large giant planet in close orbit (hot super-Jupiter). – At very low metallicities, but not too low for planet formation, there will be a whole series of small to medium-sized (sub-terran, terrestrial, mini-Neptune) planets in rather close, tight and regular orbits. Previous post: DSAC: Paradigm Changer for Deep Space Navigation?